Zoho Social Review: "Great tool for social media posting for businesses"
We are using Zoho Social for publishing content on multiple social media platforms and scheduling posts. Social media marketing is very essential for any business. However, if you are present on multiple platforms, its a big challenge to post content on them regularly. 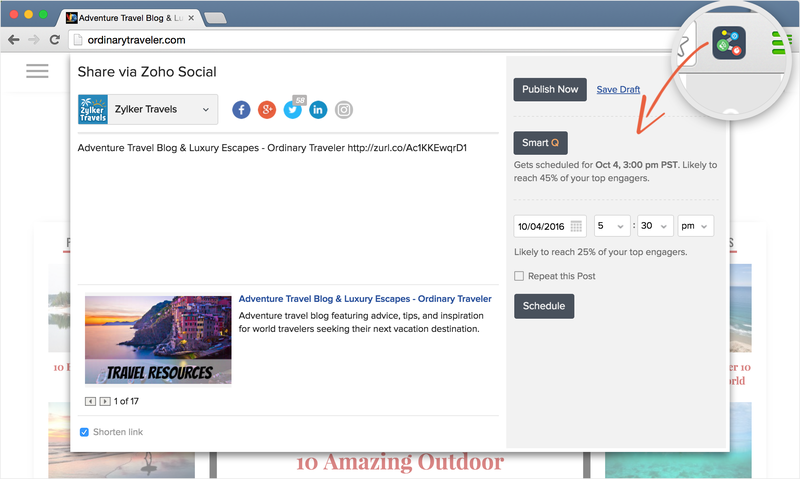 Zoho Social is a fantastic tool to plan and schedule your posts across all your social media platforms. Zoho Social Review: "Good Social Media management, but not crazy about the UI"
If you're serious about using social media as a marketing medium, then you have to use a tool to keep the stuff flowing into Instagram and Twitter and Facebook. It is impossible to have a life and keep your social media accounts up to date without one. I needed a tool to promote my business and tried Zoho, among many others. It connects well with most of the important social media accounts. Of all the ones I tried, I thought the UI for Zoho was the worst. I recognize that this is strictly a matter of preference. But I really didn't care for the Zoho UI/UX. It's good for the type of use I recommended - business that needs to keep the social channel stuffed with content. If you can accept their particular interface, (both on the browser and the Android phone), it'll likely do the job for you. Review: "Zoho Social - The Social Media Management App You Haven't Tried... But Need Too Now"
I use Zoho Social as my main tool to monitor my company and brand across the major social media channels. The ability to create saved searches in Twitter streams, in particular, helps us to source leads and business opportunities. Having one consolidated dashboard to see the status and health of my overall social networks is extremely efficient and useful. The biggest advantage in my mind, is being to able to take action and directly respond to people on the relevant social media channel all from within the Zoho platform itself. Dashboard - command center for all your social media accounts in one place. Great info and statistics at a glance. Interaction - Zoho Social allows you to interact with people directly in real time, on any of the connected networks without having to login to that specific social media site. This saves time and allows you to really get into a good flow of interacting on social. Multiple Brands - if you have multiple businesses, different locations, or manage accounts for clients, Zoho Social provides a really great way to monitor, manage, and interact, all from one login, for all of them. Very nice functionality. If they had the functionality to curate and post content like Buffer does from RSS feeds it'd be amazing. On occasion their support can take some time to get to you - however, they have always resolved my issues. 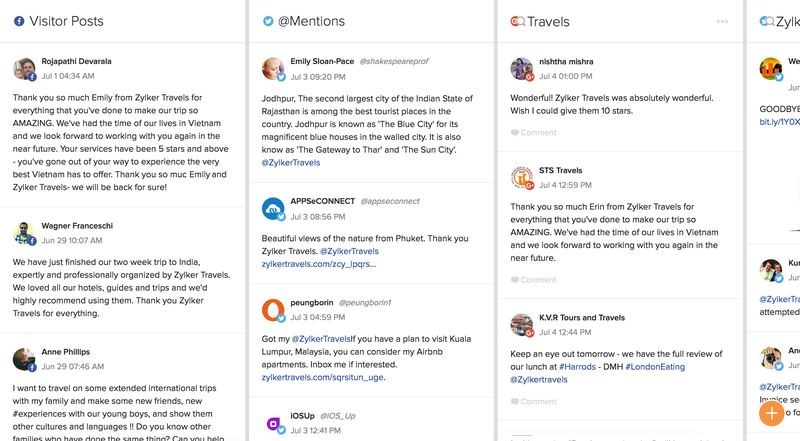 If Zoho Social posting UI was a little more streamlined, I would be inclined to perhaps consider moving all my social media management and marketing to them. Also, I think they need easier integration with some third party services. Zoho Social is well suited because of robust features and functionality and a very fair price point for start-ups or small businesses looking for an effective way to proactively manage their social media presence. It is less well suited for a larger business that desires a greater level of automation from their social media platform. Zoho Social Review: "Easy social media management"
We use Zoho Social in our organization for social media management. It is used by our marketing team. We plan all our social media posts in advance. 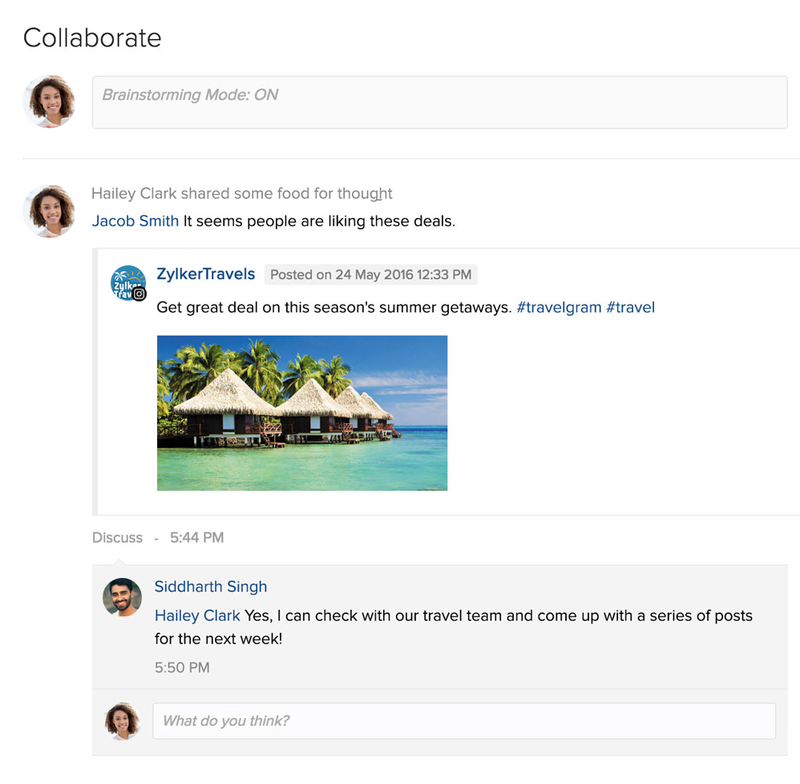 So all our team [members] can create draft ideas and show them to other team members in Zoho Social. After that, we can choose the best post ideas and schedule them to be posted automatically. No need to do it manually. So, Zoho Social gives us freedom and convenience. Zoho Social is best for planning and scheduling social media posts. Also, it is perfect for collaboration with a marketing team for social media posts. Would recommend it for social media monitoring, too. With Zoho Social you can easily track your brand mentions in social media. Just 5 main social networks (Facebook, Twitter, LinkedIn, Google Plus and Instagram). Zoho Social is the best tool for social media management starters. [It has a] clear interface, and is very easy to use. It has everything you need to start your social media management and monitoring. Zoho Social Review: "Zoho is the way to go!" We use Zoho Social to manage all of our social media posts across multiple platforms and to gather analytics. Our whole organization uses it. We were looking for software that is easy to use with a user-friendly dashboard and we found it in Zoho Social. The one click share feature saves our company time and removes the hassle of logging in to multiple sites. 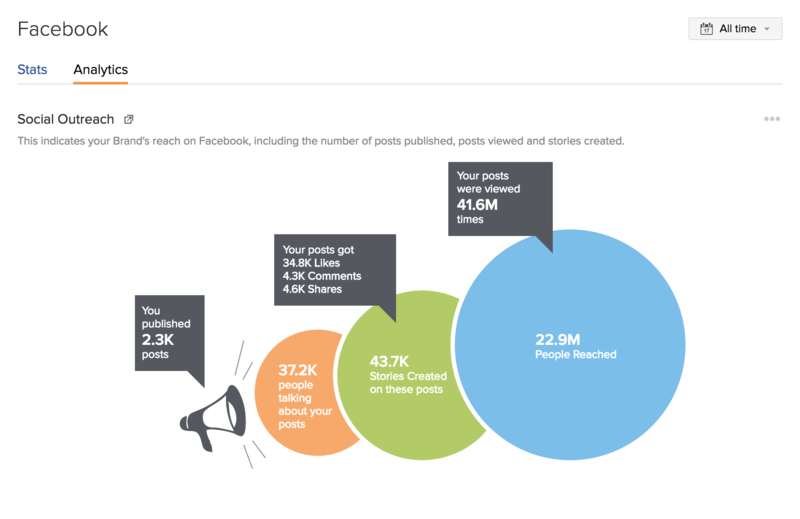 You can get a snapshot in real time of your social media stats all in one place. This is our FAVORITE feature! You can post to multiple social media sites with just one click. This is a huge time saver! 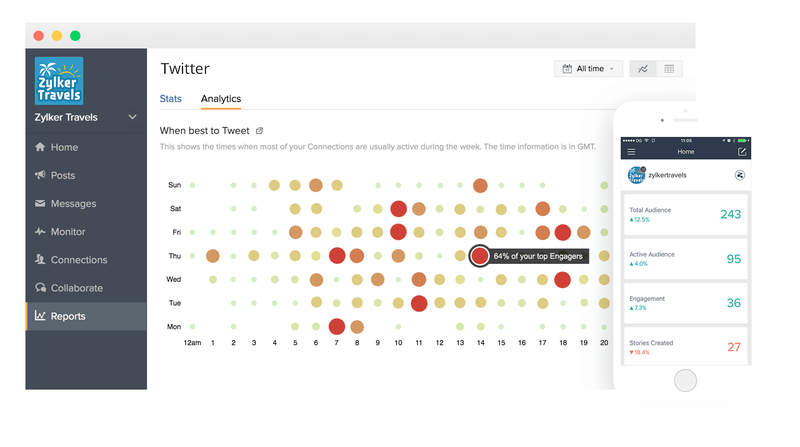 You can view all of your social activity in one dashboard. The design is beautiful and very easy to navigate. I can't think of one thing I would change about Zoho Social. I love it that much! Zoho Social is very intuitive and easy to use. I love how the feedback is displayed in chronological order. One like from Facebook and then feedback on a Twitter post... you see your activity live as it comes in across multiple platforms. I do everything in Zoho Social now and rarely leave the app to visit the main sites. This is a one-stop shop! Review: "Zoho Social-The Social Media Management Platform that has it all figured out"
We currently use Zoho Social to manage the accounts of three clients and our own. We are managing all of their social media accounts, more specifically Twitter, Facebook, Instagram, LInkedIn and Google Plus, all of which Zoho Social manages. Since we are a small organization, it is being used across our entire organization. The reason we particularly like Zoho Social is that it gives us a quick gauge on how we are engaging across all of the social platforms. For example, we are able to see very quickly any brand interactions and what type of media is working for our clients. The social analytics reports are very easy to read and give you an idea of how you are trending across your social platforms. It is also great to see which posts are engaging your audience the most with just a glance. The User Interface is very easy to navigate. You simply click on what you desire to look at on the left and it is there! Some platforms have so much going on that it is difficult to navigate through quickly. If you are handling a lot of accounts, Zoho Social makes it easy to measure your progress with each one because of its easy User Interface. I do like the Smart Q for automatic scheduling but it is also one of the weaknesses of Zoho Social. The Smart Q sometimes schedules posts too far in advance. I question the accuracy of the Smart Q because it does not seem to differentiate based on social network. Based on their recommendations, for the maximum engagement, I sometimes have to have two posts scheduled to go out at the same time. I am not quite sure about their collaborate tool. I am thinking that it is for teams to discuss and brainstorm social strategies and relationships. I do not find my Twitter posts being updated too often in the recent posts section. When I measure the Zoho Social reports against other vendor reports, some of the data seems to be missing. It is not within the reports themselves, but rather in their quick glance at recent posts. Again, I only found this happening in the Twitter Feed. Zoho Social is well suited for managing several accounts with ease. When we are looking for content to post for our account or our clients, the share browser extension allows us to quickly schedule posts as groups for our accounts or our clients. The Smart Q is right there as well, so we are able to post quickly and efficiently. Zoho Social Review: "Ease of Use, Affordability & Function Zoho was the clear winner for me"
I have a small retail business, I sell both online and in-person. I searched and tried many different platforms for my social media marketing, some were better than others but Zoho Social offered me everything that I needed to schedule, maintain and track my social media accounts at a very affordable price point, which when you're a small business owner every penny counts. Zoho offers an easy to use platform, a valuable service, reliability and the availability to cross it into other platforms. It was the best all around solution for my company. Affordable Solutions for Social Marketing. Reliability & Stability - Their platform works flawlessly and I've never had an issue with any downtime. Very stable & reliable. Ease of Use - Very important to have a platform that does not require an intense learning curve. Their platform is straightforward, easy to navigate and use. Today it is vital to have regular, consistent social media posting and engagement over multiple accounts. Zoho is allowing me to not only keep up and keep track of multiple social media accounts it has afforded my time that can be spent engaging and growing my business without having to shuffle multiple accounts. Social media is a vital, necessary resource in today's competitive market, Zoho has given me the tools I need to keep up. Zoho Social Review: "Great social media management tool"
We are a startup nonprofit of patients with a rare disease. The Zoho social app has allowed us to manage our social media presence from [one] location along with analytics too. Since we are a startup, we don't have a lot of funding yet, so being able to use the app for free at a basic level will allow us to grow into using it more. The ease of selecting the social media networks you want to post to. It integrates with your Zoho main account so you can easily switch between their different services. The interface is really nice to use. It would be nice if they would support some other networks like Pinterest, etc. Give more functionality to the free program that is available in Pro if you use other services of theirs. Provide extra services to nonprofits for free until they can get off the ground. It works great for managing our social media presence in all of our different outlets, but isn't able to natively post to Instagram without using your mobile phone. It would be [great] to have that functionality and not have to use special steps to post there. I believe that may be an Instagram limitation, though. Zoho Social Review: "Great price with some great features"
It seems that these days you need to post to all social media platforms and zoho social makes that task a lot simpler. We are now using zoho social across the company to help keep all of our social profiles (including the long forgotten but seemingly needed Google Plus). Reporting - a list showing your posts and current activity is brilliant. All others seem to only show you how the post has performed since you used the software while Zoho can do this retrospectively. Instagram integration as standard. Not a paid add-on. Brilliant. Could really do with supporting more brands on the basic paid plan. This is a useful tool for most businesses who have multiple social media profiles and not everyone who uses them are a rising social media star who uses this as their main tool. Great reporting, a pretty good price and lots of social profile integration. Also features a native app for iOS and Android. User Review: "Really Enjoying Zoho Social." I have used Zoho Social for my business (photography) as well as a retreat I host and also for my husband's real estate business. It enables me to schedule social media posts for three different businesses simultaneously targeted at the best times, for the best results. Our web traffic and click throughs have greatly increased since we started using Zoho Social. Our social media posting has become much more consistent with zoho social allowing our customers to keep our brand in the forefront of their memory. The system is very easy to use and allows you to post on multiple social media platforms at one time. We have had great engagement and success while using Zoho Social. User Review: "Zoho Social Gives B2B A Boost"
I enjoy how everything is contained in a single dashboard. We schedule publications and are able to adjust the schedules according to which social network we choose. The platform is updated for continuous improvement. Support is always able to assist quickly and very carefully. It allows us to really hone in on our different audiences on each platform. We are big fans of how Zoho puts the data front and center. Zoho Social is tremendous for B2B marketing. It may be somewhat limited for B2C. It does not allow for a lot of creativity, which isn't as harmful to a B2B as it is a B2C more often than not. Additionally, if you have a company that needs to show off visually, Zoho Social will be limiting as you cannot post multiple pics, plus there are no Instagram or Pinterest options. Zoho Social: "My Zoho Review - Listen Up"
We are using zoho social across the organization and found that there are far too many intranet solutions out there that are far too expensive. zoho social fits the bill. I haven't really found any. It's well suited for a "connected team" that wants to go all digital! I think it's perfect for small teams with an intranet that need quick access to documents like price lists etc., and feel that it's well connected to an active social media following. We think it may not be as well suited for many many users of an intranet. Zoho Social Review: "Best small business social media publisher"
I use Zoho social on a daily basis for my own business as well as recommending it as a solution for other companies. I have found the setup and information it provides more valuable than Buffer which was my preferred platform. The ability to see how the brand is performing gives easy to read analytics and the scheduler is probably my favourite feature with the ability to use SmartQ based on your audience. Including the ability to design social media posts within the application would make this a phenomenal program (such as PromoRepublic). In the case of a new social media account, SmartQ doesn't always have enough information, would be useful to combine this feature with regular scheduling. Price Point, compare to other platforms is a little high. If cost and post creativity are an issue there are better platforms. Zoho Social Review: "Fantastic Social Media Tool"
We are using zoho social to update all of our platforms easily and with consistent content. Information - providing an up to the minute account of what is going on with your "Brand"
[It's well suited in] any case where social media coverage is important. Zoho Social Review: "Simple, Fast and Very Professional"
I started using this tool, looking for organization and fluency when making posts. I love the idea of unifying everything under a single desk. It's excellent to schedule publications, you can even adapt the schedules according to the social network. It's regularly updated for continuous improvement. Any errors that have been presented to me - support is always able to assist quickly and very carefully. For any user, novice, intermediate or advanced, this tool is very recommendable thanks to its organization. It allows you to program, in blocks, and by individual or separate networks. You have many advantages; it saves time, you do not [have to] depend on third party programs that would charge extra for this. It is not too expensive. Zoho Social Review: "Great value for the money"
I use Zoho Social to manage my own brand. I think Zoho is a good alternative to some more expensive solutions. It has some basic features like posting to social networks, but also some more advanced, like brand monitoring, and mentions. You cannot use a software you don't trust for tracking your clients' mentions. In these terms, I trust Zoho. Zoho also provides you with a nice feedback with well illustrated reports. Nice piece of software, overall. Zoho is well suited for needs of everyday posting, and tracking, but it lacks some more advanced features for fast responding, team collaboration and scheduling content. User Review: "Zoho social or nothing !" Being a small company you have to manage a lot of things especially social networks. Zoho allows us to have really efficient monitoring about what happens and better management all in one interface. Good monitoring of all social networks. Excellent report of social activities. Android app doesn't synchronize Instagram all the time for scheduled posts. Zoho social is really good at analyzing your social platforms and tells you when and where it is more efficient to create impact. Unfortunately, the app is not as complete as the platform for now. User Review: "Zoho Social--I love it!" Zoho Social is very user friendly. There is nothing to download to start....you can begin using it immediately after signing up. It's easy to use without having to go through a lot of detailed instructions. The interface is simple to understand and put to work for you. I use Zoho Social to organize and manage my social media promotions across major social media platforms. My favorite feature is the bulk scheduler so I can schedule a month in advance and stay on top of product promotions. It's easy to upload a spreadsheet and I use multiple ones to stay organized. The bulk scheduler is the key component that keeps me coming back. Easy to use and very quick to set up to get working. Customer service is on the ball with any questions or complaints. For anyone who has multiple social media platforms and would like to schedule posts in advance, I recommend Zoho Social. Zoho Social Review: "Zoho Zaved my Zocial Prezenze!" Zoho Social is great! It has seriously helped me streamline my social media presence and continue growing not only my following but revenue as well. I'm able to schedule and view all my posts in one place making it so much easier. I have seen current profiles increase and brand new profiles absolutely take off. I'm able to show my management exact numbers and results of our media presence and I'm also able to show them what is working best where and why it's working best. I absolutely love this software and will be purchasing the full version. I won't ever run another company without it. It tracks the reports very well. It gives me a precise layout for my management to overview monthly or weekly. The post scheduling is great and the fact that you show the limitations of each media on one post (number of words for Twitter, only showing thumbnails on LinkedIn). Linking other media was really easy as well. I need more things under Google+. Add more users to the basic plan. Include tips during initial use. When I was starting my first company Zoho made it incredibly easy to establish our media presence. It allowed us to release all media at the same time with precisely scheduled information on each one. This created an even flow of traffic on all media and allowed us to reach several untapped demographics within our industry. Zoho is for sure a far better software than Hootsuite could ever hope to be. User Review: "Zoho Social is Top Notch"
We use ZOHO Social to schedule our daily post and to choose the optimal time in which to make our social media post. This tool frees up time for our team to concentrate on active clients knowing that our post are already scheduled to stay engaged with our social media followers. Zoho allows the user to post to several platforms at the same time. The tool has Social IQ which predicts the best time to publish your postings. The system is readily available on your CPU, tablet and mobile phone. It would be great to post multiple pictures in a single post. We are a real estate firm who likes to connect with potential clients daily. This tool allows us to post listings and repost them at a moments notice without having to retype our post. The ease of use is just what we needed as we can fire off a post quickly and confidently. User Review: "Zoho Social is really powerful"
We are using Zoho Social to manage our four social media accounts in one place, and as a Zoho CRM user, it let us cross information to have more control over publishing and identifying potential leads based on followers' engagements. Scheduling posts, so you run your communication strategy smoother. Let us identify new leads based social engagement and messages from followers. The IQ function, suggests best post scheduling, so we can have more impact on our messages. Automatic leads registration for Zoho CRM based on engagement from social networks followers. Automatic post to Instagram, so we don't have to open the Instagram app to complete a post. Zoho social is really a cost and time efficient tool, which let us concentrate in our business as we automated our social media strategy. Zoho Social Review: "Zoho - A positive addition to ProHealthForce Recruitment"
Our industry is packed full of time restraints and a lot of hand on efforts. Time is valuable and crucial. Zoho Social has helped us maintain our social media updates with ease and has also helped us keep our clients' needs at the forefront and organized. Zoho Social is very well suited for organization and integration into social media updates. User Review: "Zoho Social is a good tool"
The Zoho Social app is excellent. We have managed to automate some functions that would be assigned to a community manager. This application helps us a lot to understand what the state of our brand is on social networks and to control the behavior. Zoho Social has a low price compared to other tools. It's a great tool. Price vs. options is very good. Zoho Social can be a more complete [tool] by explaining the brand evolution. Tips to improve the brand value can be shown on the reports. This helps community manager to brand with this app. We use Zoho to manage social media activity for several clients and have found it to be one of the best social media management platforms around. It provides us with all the functionality we require, it is easy to use and has so far been very reliable and cost effective for us to use. Very easy to schedule posts. Sometimes not immediately obvious which brand you are posting for. Review: "How Zoho Social can be used to position your brand"
I used Zoho Social to program all my postings on Twitter and Facebook to promote my own company. With this I get more people to follow me as I post topics regarding my activities of digital marketing. I get more people following me and interested in what I do. Posts programmed and save time. Interact with the main Social Networks. Monitor the impact of the posts and analytics of the job. I wish the product interacted better with Instagram. I couldn't use it in LinkedIn, as it only works with enterprise profile. I wish the free plan can be used for more brands. Zoho Social is well suited when you are trying to position the brand, as you can program the posting and try A/B tests. With the monitor and Analytics you can see which one is the best campaign. It is less appropriate if you are planning to use Instagram (as i cannot use it for that). In general works fine. Zoho Social helps marketers in small to large organizations to grow the social media presence of their brand with actionable insights focused on content and engagement. Zoho Social provides marketers with pre-publishing insights based on the engagement level of previous posts and the activity of their audience. Zoho Social even goes a step ahead to shows users the percentage of their audience that’s likely to see their post now, suggests the next best time to post and lets them schedule a post to go out at the same time of the day in different time-zones. Zoho Social's real-time monitoring dashboard helps marketing teams listen to what’s being said about their brand. Users can search and track a keyword; and respond when they need to. Instant notifications ensure quick reactions and guarantee that no relevant conversations are missed. Within Zoho Social, numbers are included as a value add, around publishing and listening features. A dedicated reports tab provides social-network-specific statistics and detailed analytics enabling users to understand more about their audience and how people engage with their content. English, French, German, Spanish, Portuguese, and Italian.